I recently returned home from a retreat held in Vietnam where Serge Benhayon was presenting on “The Process of Evolution – The Living Sciences of Human Life.” It was an expansive topic and truly revelatory. It was presented that we are all part of a living science and Universal order where we can either choose to align with the evolutionary pull towards a one unifying way, working together in co-creation, or we can – by our own free will – choose to resist this natural pull. Simply put, life in self-made creation (in contrast to co-creation) is one where we are immersed in all the attractions, distractions and emotional highs and lows of our physical life. It can be difficult to clearly see for our ‘vision’ is limited by the very consciousness or quality of our chosen thoughts and beliefs, which then become our life, and therefore our reality. As my awareness continues to expand, more is unfolding and coming to light around this understanding. I took this photo in Vietnam before the retreat officially began and it was reflecting to me all that was to unfold. In all its beauty, the lotus flower is still within the consciousness of creation. It is however, often used to represent the state of liberation in Buddhist philosophy, rooted in the mud, while its flowers blossom well above the waterline, unaffected by the muddy waters of attachment. This was often seen as the final goal, but this is actually where it begins – the beginning of a Way of Living, free from the imprisonment of our self-made creation. When I was young I felt like we were only being told part of the story of life; it just wasn’t right that we were born, we lived and we departed. I knew that there was much more to human life than that, and this led me to investigate many spiritual ideas and beliefs over many years. I believed at that time I was seeking to be liberated from this limited life, and to reach an enlightenment of some sort. I spent many hours in meditation trying to reach this elusive place of understanding I was seeking. On reflection though, I question what did I want to be liberated from, and what or where to then? It was not true liberation I was seeking, it was actually life I was looking to escape from; the harsh reality of what I felt overall was a loveless world, where we were living so much less than I knew to be possible. In truth I was looking to re-connect with my Soul, and it is through the grace of my Soul’s light, and my loving dedication and acceptance of my responsibility, that I began to see clearly through the grand illusion I was held in, the deception of right and wrong, the highest ‘good’, and the illusion of false enlightenment. What I didn’t see then was that we are all in this together and we can only truly evolve and be free of this way of life, with its limits of our self made creation, when we are working together towards our return to a one unified way of being. The tension we can often feel is because we don’t live this way, and we are constantly being pulled to this awareness while shattering the illusion of the individual separated life. Our Soul is constantly communicating our oneness with us. In my experience trying to understand life and my place in the greater plan from a dimension that can only see its own creation was futile. This is why it never made complete sense to me, as I was caught in the web of it. It was like being in a lift and getting out on the fourth floor so to speak, and that becomes my reality, that’s all that I can see. However, as I stay open to the possibility, and now a knowing that there is a fifth floor and beyond, a greater awareness is unfolding, becoming available, and so much more is being revealed. I have a new appreciation of the truth of ever expanding Evolution. The Lotus flower now represents to me the liberation from the limits of self imposed creation and the beginning of an Age Old Way of Living, a One Unified Way in co-creation that is ever evolving – a way that is ours to choose. The mud of creation constantly tries to drag us down into the abyss but Universal Medicine and the Ageless Wisdom shine a Divine light to show us that there is a way to live that together we can all know the truth of Co-creation. ‘However, as I stay open to the possibility, and now a knowing that there is a fifth floor and beyond, a greater awareness is unfolding, becoming available, and so much more is being revealed.’ I love this way you’ve described and are living. We can’t imagine what it is or be given pictures, it’s a felt knowing that can be trusted because our body lets us know its truth. Life in co-creation connected to God and our soul is remarkably different to the human made creation, and we all innately know the difference because we see abuse, corruption, violence, pain and suffering and we know it doesn’t make sense, we do know there is a different way to be with ourselves and each other. We are born, we live and then we depart… but in this we come from where, and when we pass where do we go to? Like you Victoria these are questions I have always pondered on. ‘Getting out of the mud’ is indeed not the final goal and The Way of The Livingness is the Path to continual evolution. When we come to the understanding that there is a bigger picture to life it is at that point that we commence the path of our evolutionary journey back to soul. 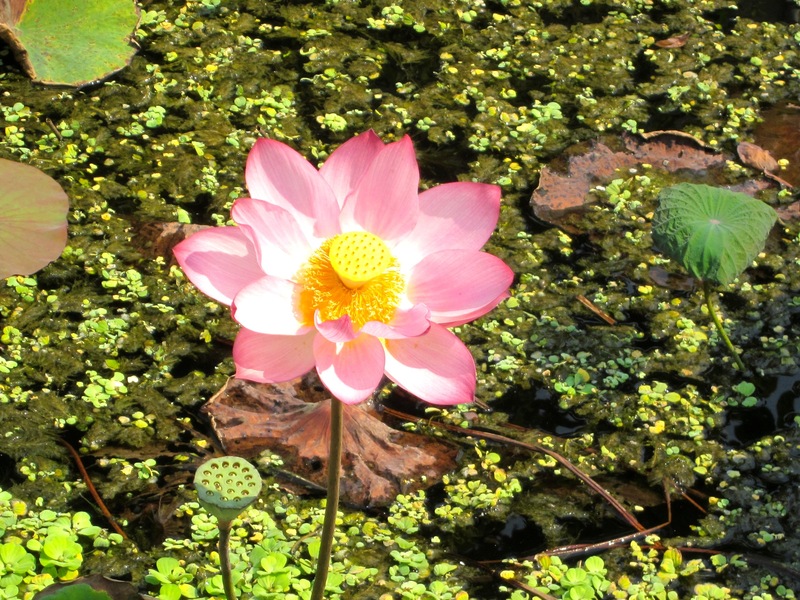 Being and living like a lotus is just our way of bettering our lives, indeed it is where it begins. For centuries we have been living “life in self-made creation” and the proof that it does not is plainly seen in the that humanity is in. So true, in wanting to escape, we are seeking something else that is truer, and it is often hard to become honest enough to see beyond saying no and become aware of what we are saying yes to instead. So true Fumiyo for it is when we are honest about what we are saying yes to, we can then make true choices that lead to what we desire – love. Buddhism actually represents half the version of what evolution is about: that evolution is about liberation from creation. But that in itself is even more evil, because it makes people stop at that point, because the liberation from creation is only the start of our way back to live as the divine beings we are. That understanding of Buddhism is in fact the bastardised interpretation of what Buddha taught as you so correctly present as to what true evolution is. “In my experience trying to understand life and my place in the greater plan from a dimension that can only see its own creation was futile.” Yes and I feel this is why so many people give up on life, turn to drugs alcohol and TV to numb themselves from feeling that deep within they know there has to be more to life than what our eyes allow us to see. With Co-creation everything just seems to flow beautifully and be very simple and yet very powerful in its approach, in creation we reduce life and make it all about ourselves missing the connection to our Soul and to greater purpose. Creation aims to keep us in separation of ourselves and others, Co-Creation unites us as one, and it is through that unity that we realise that we are all here to help one another. The fact that one can liberate one self from the wheel of rebirth by enlightenment after which the process of evolution stops is indeed only a half truth and therefore a lie. One can liberate one self from the wheel of rebirth but the process starts really by offering this possibility to other people. It does not ever end. Living a life of creation is total reductionism at it’s best. Whereas co-creation opens us up to the multidimensionality, we are naturally aligned to. What force must we be living with if it can ignore the call of the soul? Victoria, that is a beautiful analogy. That lift has many storeys and we can keep going up. Interesting to see that well accepted beliefs of enlightenment, and evolving out of life is actually evil of the highest most sophisticated degree. Yes, with the world the way it is escaping is not what’s needed, but committing to love and being in connection to our soul and bringing that to life is. Yes it is not natural for us to go it alone and there are now the real issues with many people experiencing loneliness in our community because of the lack of connection with each other. It is our nature to support each other and work together. Yes, as we live longer we are often lonely longer and the more electronic distractions we have the more we think we are managing our loneliness. In a report I was listening to recently it was saying how many elderly people have only one friend, sometimes none. It really highlights the importance of community and sharing. Many live with the radio or TV on for companionship, which can never replace a loving gesture and connection from another. We create by means of a movement that is disobedient to our divine essence. That is why it is a movement that comes with so much friction. Co-creation is frictionless. It is moving in space and just feeling the beauty of just being. A movement of ease and grace and in alignment with out divinity will always be harmonious. In co-creation we feel the pull of the all, in creation we are fully immersed in the attraction of the individual’s desire for experiences and identification. The lotus flower has been used for all the wrong reasons as a symbol, as you point out. It is not the final flourishing (there is no final, Sanat Kumara continually expands) but only the beginning of sticking one’s head out above the gooey mess of creation. To raise our head out of the mud and see things as they truly are and not as we might wish them to be is one thing, but to keep going and fully resurrect our whole body and being out of the swamp of creation does not only liberate us but all others who benefit from the reflection of what it means to extract yourself out of the mud and then jump back in so you can ‘swim like a fish in the sea and not get wet’. This is an age old esoteric teaching that is still very much alive and well today. Even though our vision may be clearer when we see above the waterline, it is only when every last root we have in the mud is extracted we will be truly free of the illusion that we are free. I have changed so much since meeting Serge Benhayon, my reality before meeting him was to pretend I was coping with life, because when I looked around me it seemed to me we were all living in the same mess. Now I understand that way of living was not it. My life is much simpler with less highs and lows much more even and actually joyful, never though I would ever say that! My experience also Mary; there is joy in simplicity. Life on earth is so truly ugly that it is hardly a surprise that almost all of us try to escape from it in one way or another, but the truth is there is no escape. We have to learn how to live in this world so that it is not an ugly misery. By choosing brotherhood rather than making everything about ourselves and our families is the way and how we will eventually find our way out of here and back to where we belong. It is our soul that is constantly reminding us that there is another way to life, that we belong to a different order then the one we created here on this planet earth. And we all know this because we are all connected through soul that is of the same origin, but still choose from our free will to stay in this self created life instead. Yes, we are all part of the One whole and with this awareness we know we are never not affecting the All by our choices and movements in life. Yes Victoria, it all comes down to responsibility and to let go of the investment in this life of creation and of our individuality. Returning to soul is our way to go rather sooner than later and to start clearing the mess we have polluted life with from this ill choice. To live in co-creation or in creation is our choice. While we are made to live with co-creation, as that is our nature, our current societies shows that we are not living that and instead for the majority of us, have chosen to live in creation, the self created way of life that clearly is demonstrating that it is not it when we look to all the atrocities that take place, and the illness and disease rates. So to me it is a good thing to become honest with this fact and consider to start living in co-creation instead. Very simply put it must have been an awesome re-treat thank you. To settle for a life that is ‘better’ we are capping our true potential and living at mercy of the world outside of us, rather than living a life that is truly free, by being ourselves, guided by our connection to Soul. There is a pride in us about the self created life that think it is better and with that is withholding us from choosing to live in co-creation instead. What a beautiful representation the lotus flower now is for you – which shows how our soul is drawn to constant expansion – it continues to pull us out of creation and all the complication that comes with it. It is our movements in or out of alignment with our soulful light that choose what thoughts are coming through us. We are bodies of expression, instruments of light. Seeking ‘liberation’ or ‘escaping life’ ? – the question every spiritual seeker needs to ask and answer before he can be sure where the search is taking them. Well said Alexander – as the more we evolve the freer we become. Yes a great question to ask. Being spiritually ‘liberated’… that is free of the spirits waywardness is not found in any search. There can be no escaping oneself and what is needed to address in our steps away from embracing in full who we are, it is rather an inward movement and re connection to all that is. The symbol of the lotus flower beautifully brought to life not by knowledge but by your personal exploration and understanding and thus in the unfoldment of embodiment through the livingness of its truth. How do we know again what we have chosen to not know anymore? We have tricked ourselves into a perfect set-up, we are the perpetrator of our victim-hood; it would be funny if it wasn´t so devastating and the greatest perversion imaginable. It is the cause for the state of the world, the difficulty and at times seeming impossibility to change for the true better that we actually long for, while holding onto the investments that result in the misery. Along comes the Ageless Wisdom and offers us the steps out of the mud, exposing the mud for what it is, and reflecting what we have left behind and can return back to: co-creation. Exactly Alex, how do we know, or why do we not want to know ? It requires honesty and a willingness to admit we are in the mud before we can begin to extract ourselves, and we have every support to do so thanks to those that have walked this path before us. It is impossible to marvel at the geometric beauty and symmetry of the spider’s web when we are caught in it. So too is it in life when we get so absorbed by a certain way of living that is fed by our own desires and all we can create for ourselves, that we no longer see the beauty we are and are from, nor that which has ensnared us to not live it. and step by step we extract ourselves from the ensnarement when we are willing to see through this web of deception. Yes, step away from it without beating at it as then it would ensnare us even harder. I love your analogies Victoria. The Macadamia nut showing that we are part of something much bigger that offers and inspires others to see this too, and getting off the lift on the 4th floor showing how limiting we allow ourselves to be when we choose to think this is as far as we can go, and all that we survey is all that life has for us, and …”The Lotus flower now represents to me the liberation from the limits of self imposed creation and the beginning of an Age Old Way of Living, a One Unified Way in co-creation that is ever evolving – a way that is ours to choose.” Knowing this is only the beginning as we release ourselves from the shackles of creation and set ourselves free to explore the vastness that is offered on the 5th floor through the Ageless Wisdom and understanding what it means to live in a One Unified Way. Yes and in truth we are returning, as you say a releasing of all that has held us captive or blind to the truth of our oneness. With so much war, aggression, abuse and corruption on all levels it is easy to see why people (including myself) have looked to meditation as a way to escape it all. However, Serge Benhayon has taught us all how it is possible to live within this current global strife and not allow it to effect us negatively if we simply stay connected with our bodily movements in everything we do and observe life while knowing we can read and understand what lies behind our actions. Observation is such a key that allows us to read and understand the broader picture of life, and our responsibility in this. Our connection and presence with the body truly supports us to see clearly. ‘It was not true liberation I was seeking, it was actually life I was looking to escape from’ when I read this, I thought of the countless times I used meditation to escape from the world and shut everything out. Did it make life any better? No, if anything it made it worse because as soon as I opened my eyes it was still there staring at my face. Its only when I started to connect with myself I could feel the difference and then it became apparent meditation was about me connecting to me and who I am with the world. I see the world differently and my purpose is to reflect this to whoever is open to it. Yes, I once had a friend ask me how meditating for hours a day truly helped humanity and I never forgot that, it exposed the self indulgence that meditation can be if used to escape. One can connect in a moment. “a way that is ours to choose” There is a Divine freedom and a responsibility in the choices we make in the way we live that affects not only ourselves but also everyone and everything around us. Our Soul is in constant communication with us and in that we have to understand that life is so much more that the three dimensional life we all together think life is and this communication from our Soul is proof of that. When we all do come to this understanding, the idea of life being only three dimensional will come to an end and the multi dimensionallity of life will become our normal way. Yes Nico. Learning to live in this connection to our soul is probably the most valuable and precious thing we can ever do for ourselves. And once we have learned it, we cannot but bring this livingness back to the world providing space for everybody to experience the same. Yes and we go around and around and around again until we are prepared to see outside of the bubble of our own making. As more awareness is allowed so does our view become more encompassing of the all we are a part of. And as we open up to more awareness, we also allow ourselves to feel the grandness and love that is inside us, all around us and beyond. ” It can be difficult to clearly see for our ‘vision’ is limited by the very consciousness or quality of our chosen thoughts and beliefs, which then become our life, and therefore our reality. ” This is very true and then we make a picture of how things should be for us personally ,our family or friends. Or we are given pictures to live up to or tin plates and we then fill in the rest to our flavour , but there is no free choice in this process so no evolution just creating more of the same just difference colours and flavours but evolving no where just going around in circles. It becomes clear how it is we reduce ourselves through the ‘pictures’ we hang onto. We circle around and around and the stage has been set. There is not space for expansion if we do not shift the setting. Co-creation is feeling the all and wholeheartedly dipping all toes in, the whole body, with no self (individuality), responding and then giving it your personal all. Because there is a physical body, I personally sometimes feel limited by the pain or discomfort in my body and self (individuality) comes in. I roll over and not bring my all or self-criticise how I have been because of my pain. Feeling the all is sometimes too much to feel. By feeling the all, and by tenderly moving in honouring the pain or discomfort is responding to how to reimprint a way that is with the body in movement and action. It’s more supportive this way then to go into individuality to ‘try’ and deal with it or work out the pain. By continually feeling and tenderly holding my body in the love that is the all I am given how to be with the all.